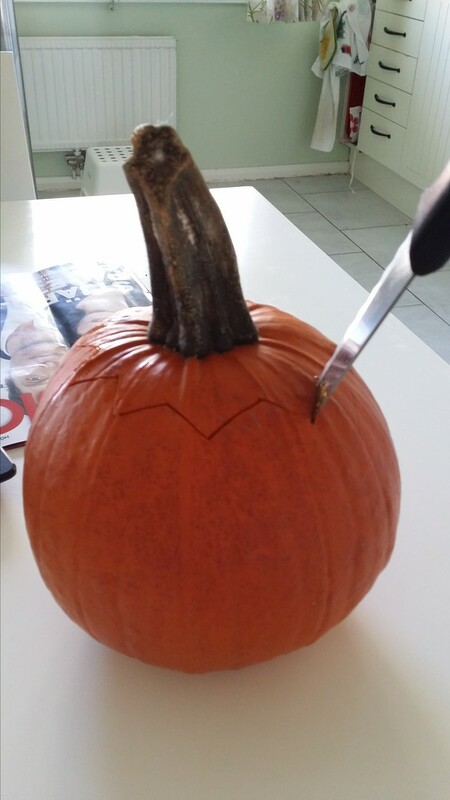 Everyone knows that I love Halloween and today I carved my pumpkin. 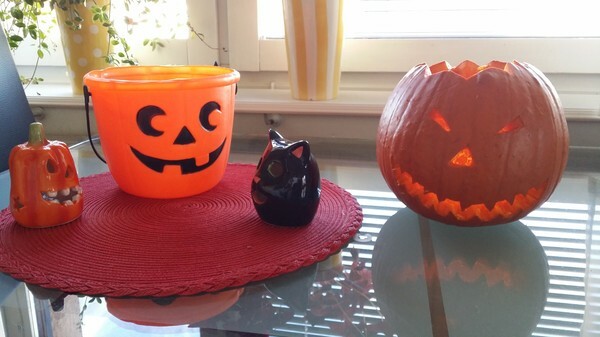 Later I will put on my costume and today will be so much fun! I am so excited! 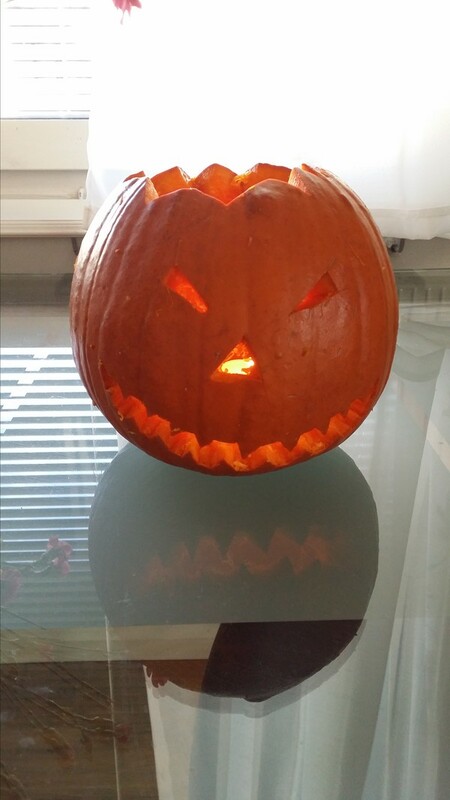 Happy Halloween everybody! Strange colours of your body's tears: Following the disappearance of his wife, a man finds himself on a dark and twisted trail of discovery through the labyrinthine halls of his apartment building. Led on a wild goose chase by cryptic messages from his mysterious neighbours, he becomes entangled in a hellish nightmare as he unlocks their strange fantasies of sensuality and bloodshed. The Strange Colour Of Your Body's Tears is a visually dazzling experience from the creators of Amer that takes you on a journey into mystery and blood soaked terror that you will never forget. This was the last movie of the horrornight and it was the strangest one. I love giallo movies and was very excited for this one, especially with a cool name like this one has. The biggest problem with this movie is that it is too confusing, the editing jumps back and forth and I had trobule following the story. 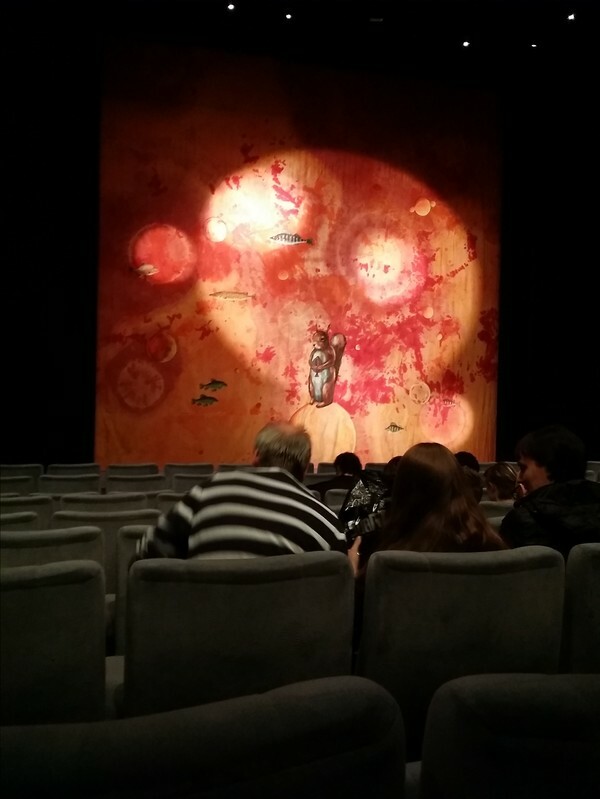 The colours were beautiful and the sound and songs were amazing, but everything was too confusing. The use of shaving blades were plenty and the use of black and white stop motion was clever, but the story did not speak to me at all. Ouija: A group of friends must confront their most terrifying fears when they awaken the dark powers of an ancient spirit board. 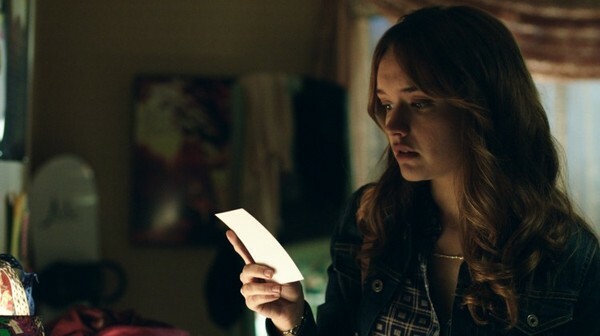 Ouija is a movie filled with cliches and when you expect a ghost, you get a ghost. There were some nice and creepy moments, but they were ruined by the obviousness of what was going to happen. The story was expected and there were some things that did not add up. The movies Witchboard from 1986, also deals with the subject of the Ouija board, but is way more creepy and scary than this movie, so I recommend Witchboard instead. Lin Shaye was great in this movie as she always is, so she made the film a little bit better, but still not enough to give it a three. 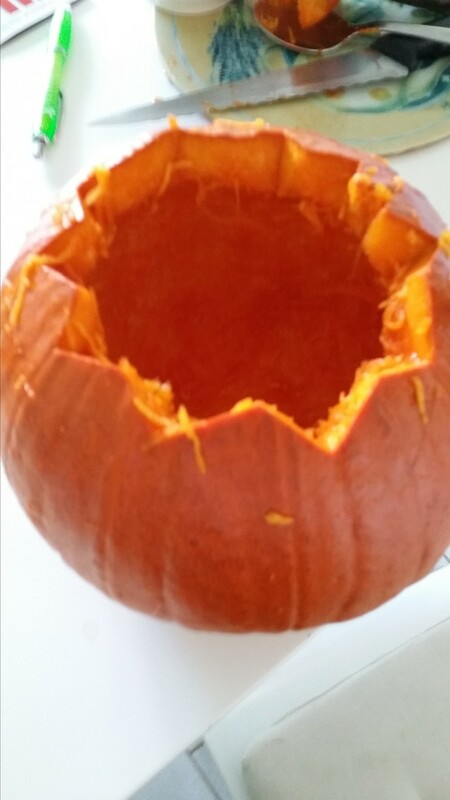 What are you all doing this Halloween? 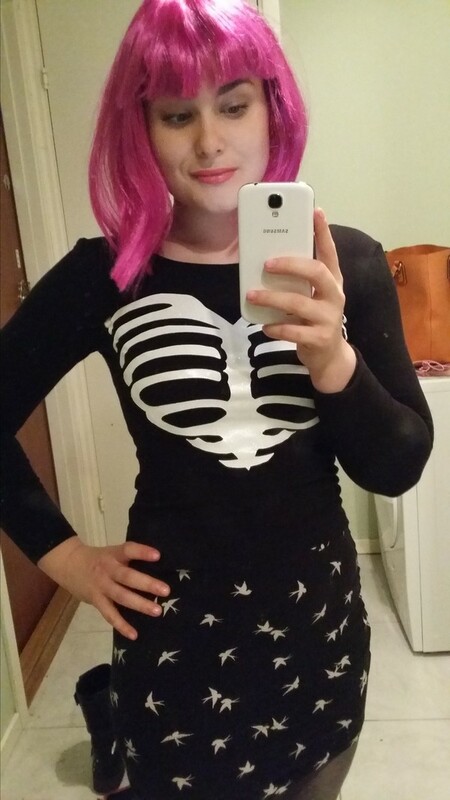 Halloween is my favorite holiday and always have been. I always watch the same two movies at Halloween and I do it as soon as I wake up. I start with John Carpenter's Halloween and then I watch House of the devil, but this year I will add another movie to my yearly viewing, so give me your thoughts on which one. 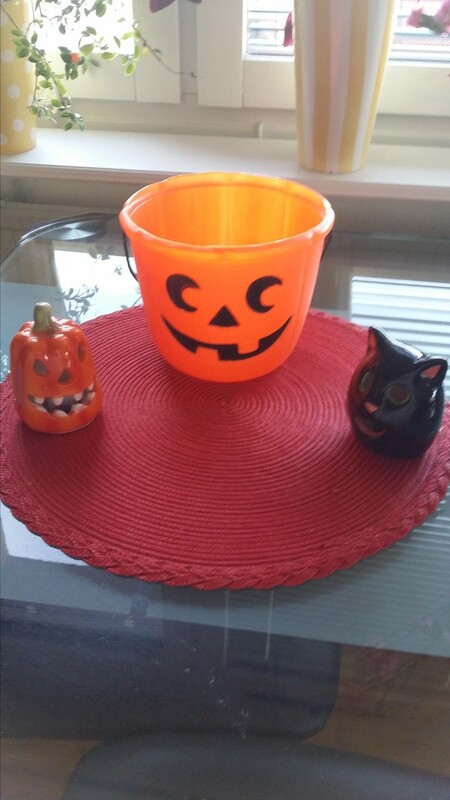 After I have watched the movies this friday I will go to a party, but I do not have a costume yet, but I hope to find one tomorrow. 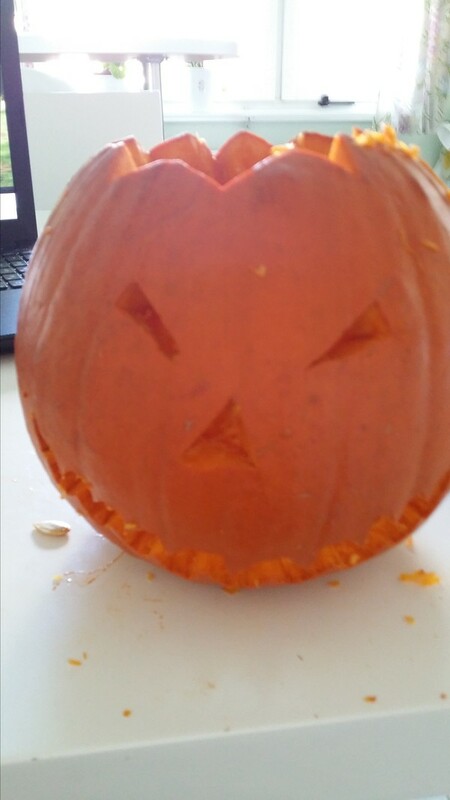 I will also get some pumpkins tomorrow and carve them, so I have lots of things to do tomorrow. Starry Eyes: A hopeful young starlet uncovers the ominous origins of the Hollywood elite and enters into a deadly agreement in exchange for fame and fortune. What makes Starry Eyes good is that it is very relatable. We have a struggling actress, that really wants to get her breakthrough role, while trying to make a living by being a waitress at taiter tots. 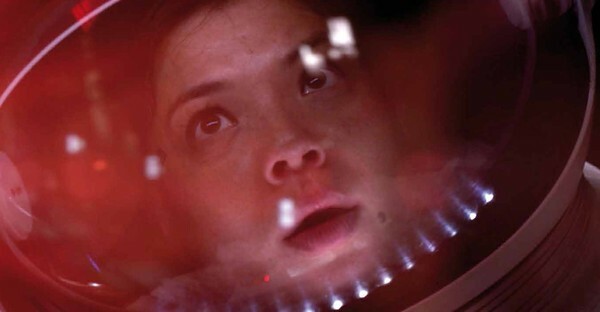 This movie takes a normal young woman and turns her into something completely different. The last thirty minutes was incredible and filled with blood and gore. Many people can become desperate and do things they would never imagine doing, just to get that breakthrough. I like movies that suddenly goes crazy, which Starry Eyes does. Among the living: Three kids skip school in order to explore an abandoned film studio lot where they catch site of a woman being dragged across the lot by a masked man. I have been waiting for another gore movie from France, since Livide. 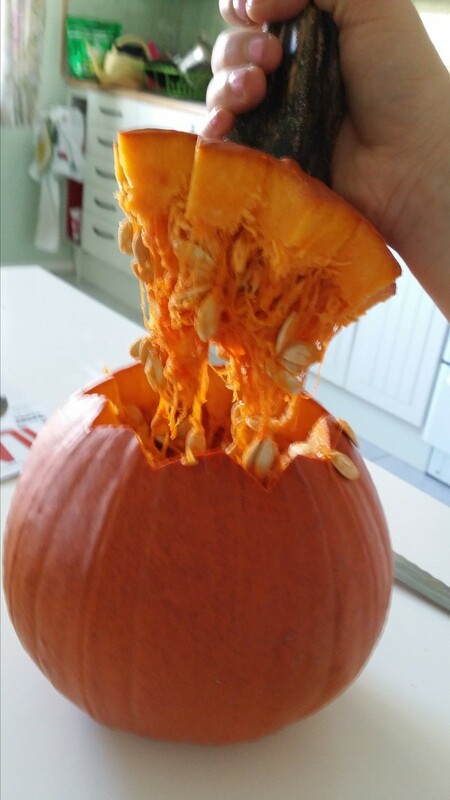 I was anticipating buckets of gore and blood, but I did not get the amount that I had expected, which was a bit dissapointing. 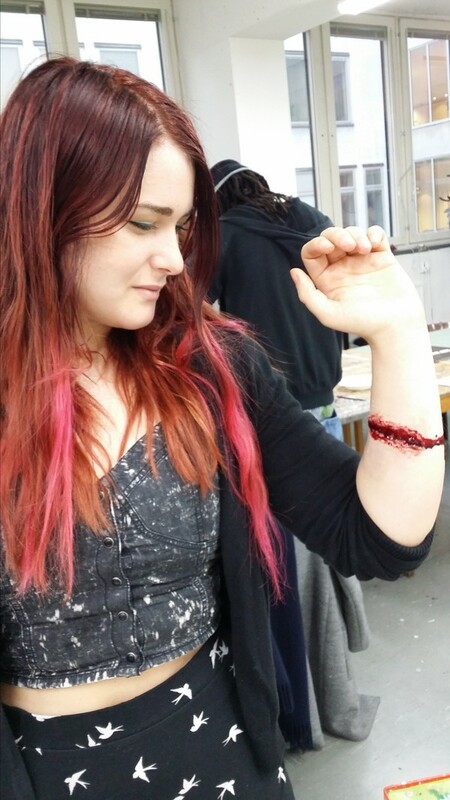 Gore is not everything, but they cut away from many good opportunities where the gore was needed in Among the living. The story was good, but not as intense as Inside, Frontiers or Martyrs. 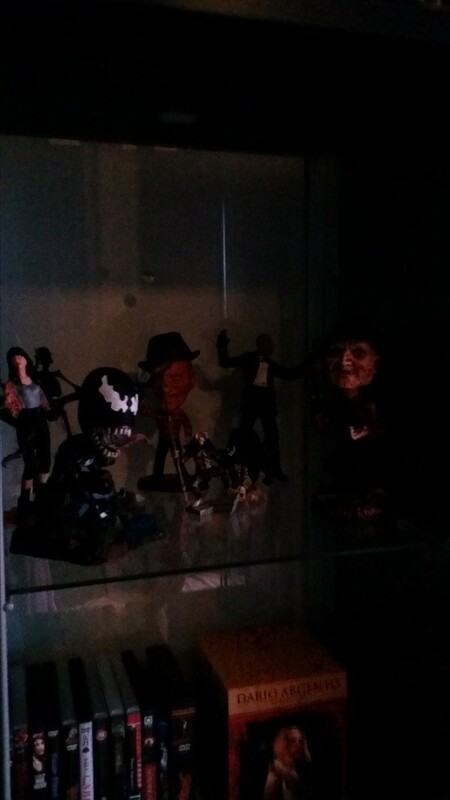 The use of the clown mask was creepy and well placed. One scene was quite gruesome because it had many different elements of torture and it was a pretty long scene if my memory serves me correct. The ending was expected, but I still enjoyed Among the living and the four is close, but I will settle with a three for now. 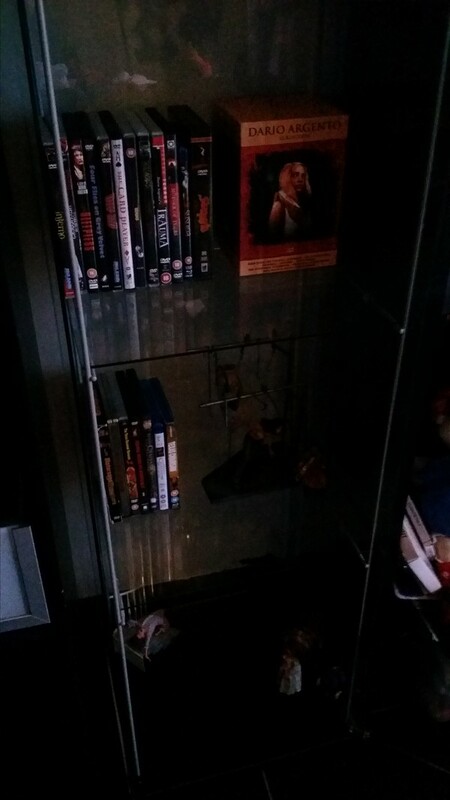 I have been fixing up my movieroom a bit and bought a new shelf made of glass. 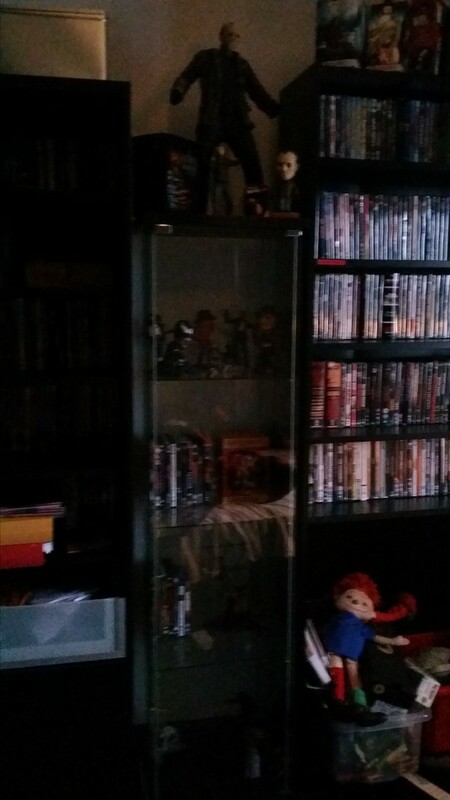 I have put most of my dolls in that shelf and my Dario Argento collection. 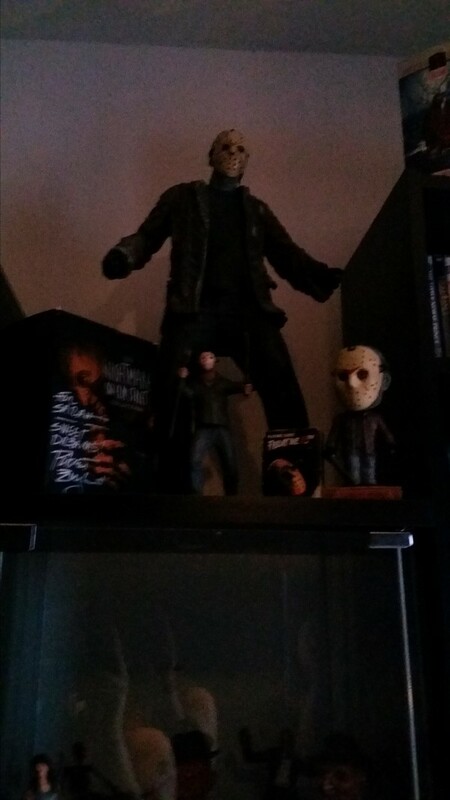 I think that I will buy another shelf and have it right next to this one, because there are still limited editions that I could not fit into this one. Let us prey: Held in a remote police station, a mysterious stranger takes over the minds and souls of everyone inside. This is also a movie that takes place over the course of one night, and what an intense night it is. I felt that the script could have been worked on a bit more, because this movie does not stand out enough. Sure the last 20 minutes are great, really bloody and fast paced, but I just wanted something different before that. Because Let us prey is not long, it never gets boring with all the deaths, background stories and gore, but it was still missing something. With that said, it is still worth a watch. 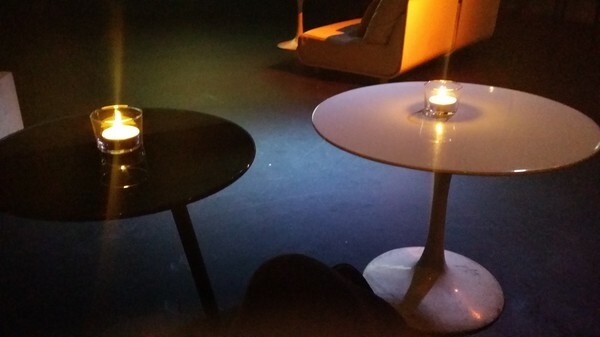 I have now attended two filmfestivals this month. 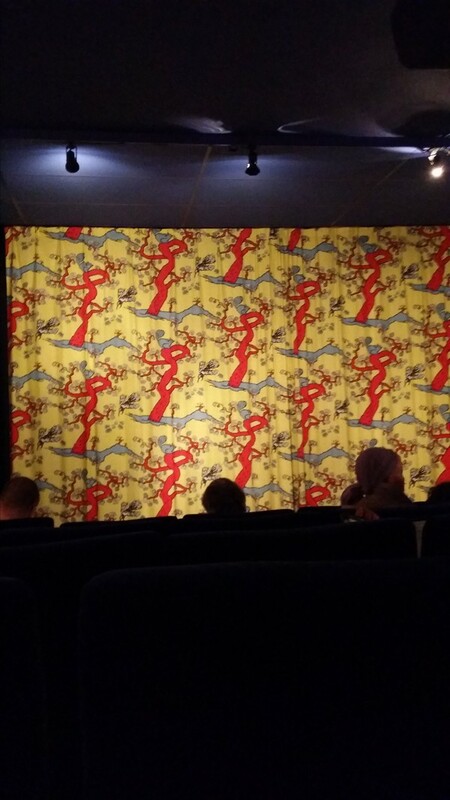 First it was Monsters of film festival and this saturday I saw a movie at the Polish filmfestival kinoteka and saw the movie Floating Skyscrapers with my mom. It is really worth going to filmfestivals and watch these films that you might find hard to find elsewhere and to experience new kind of movies. I will attend Stockholms filmfestival in november and I hope that you will be there too. Miss Zombie: A rich family buys a zombie and they know that it can get dangerous, so they also get a gun with bullets just in case something goes wrong. The zombie is helping out with cleaning the backside of the house, but many people are mean and cruel to the zombie, will it go berserk? This Japanese movie is entirely in black and white and that was a very smart move from the filmmakers. This is a very slow movie and quite different from other zombiemovies. Since the movie is very slow paced, the ending is pretty shocking and beautiful. The perfect words to describe this movie is beautiful and sad. The zombie in this movie is dead, but still human in many ways and that makes the events in Miss Zombie so much more tradig. We follow the zombie's daily routines with minor changes each day until tragedy happens and everything is turned upside down. This is one of the best zombie movies that I have ever seen. Open Windows: An actress named Jill refuses to have dinner with Nick, a fan who won a date with her in an Internet contest. In return, a guy named Chord, posing as Jill's campaign manager, helps Nick to follow in the footsteps of the actress from his own computer. Nick starts a game in which he realizes that he is only a puppet into the maniacal plans devised by Chord, to hunt down the star. The story was interesting and buildt up in a good way with some twists and turns that I did not expect. I really enjoyed the movie until the ending, when it tried to get to smart and have a clever twist. 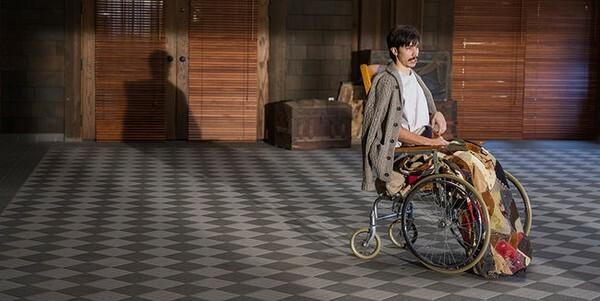 The characters in this movie communicates mainly through the use of chats through the computer, so if you know that you do not like that kind of setup, you will not have the patience to sit through this entire movie. 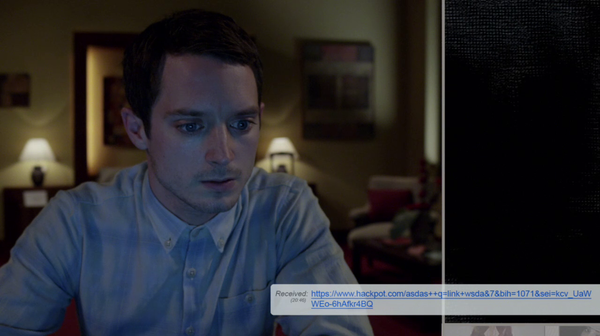 This movie kept me interested and Elijah Wood did a really good job, playing the maincharacter. 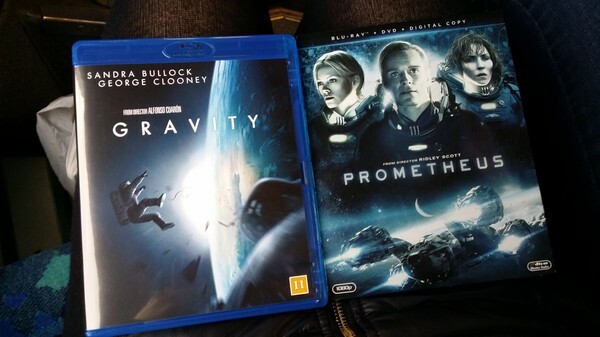 Just bought these two movies, Gravity and Prometheus. Going to watch A walk among the tombstones in the cinema later. Der Samurai: A wolf strives through the woods around an isolated German village. Jakob the young local police officer is onto him, but scents something more in the darkness. What he finds is a man, it seems, wild eyed, of wiry build, in a dress. He carries a katana, a Samurai sword. When the Samurai invites Jakob to follow him on his crusade towards the village, it becomes Jakob's mission to pursue the lunatic to end this wanton destruction. At the end of the night Jakob has experienced too much, is too far from whom he once was. Something hidden has been unleashed to meet the first rays of daylight. This German movie about a man in a dress, going berserk with a samurai sword, is really different. The story took unexpected turns and was very interesting. This movie was not as bloody as I had expected it to be, but the story was great and intense, since I did not know what the samurai would do next. The final scene was probably my favorite scene in the entire film, because of the music and the craziness of the maincharacter. The entire movie focuses on events that occurs throughout one night and it is very exciting. It is too bad that we did not get to know the samurai character more, but that character was still interesting and the atmosphere of Der Samurai was creepy all the way through. Tusk: When podcaster Wallace Bryton goes missing in the backwoods of Manitoba while interviewing a mysterious seafarer named Howard Howe, his best friend Teddy and girlfriend Allison team with an ex-cop to look for him. Another different movie in the surgical subgenre, where a human being is forced to transform, against her or his will, with the help of surgical operations into something completely different. Tusk is build up in a very clever and beautiful way, that balances dark humour with horror perfectly. 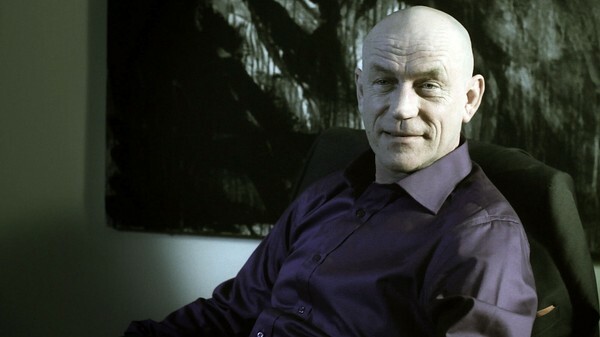 The dialogue was very interesting between Wallace and Harold and the characters in Tusk were well written, my favorite character was probably the ex-cop, he was hilarious. 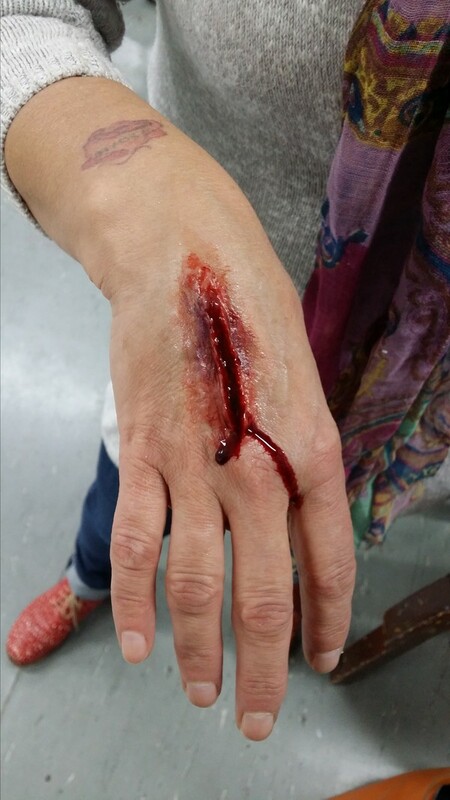 The effects were great and the showing of the final product was both funny and gruesome at the sime time. I want to see this movie again and I will probably watch this at least once every year, just like I do with the Human Centipede movies. Kevin Smith, please make similar movies like this one in the future, sincerely, a big fan. These last five days have been some of the best ones this year by far. 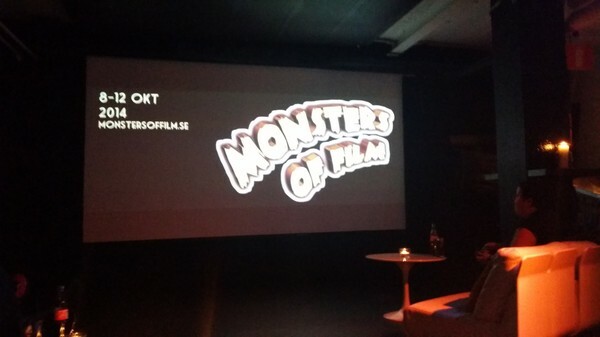 Stockholm had a film festival called Monsters of film festival which focused on horror and sci-fi. 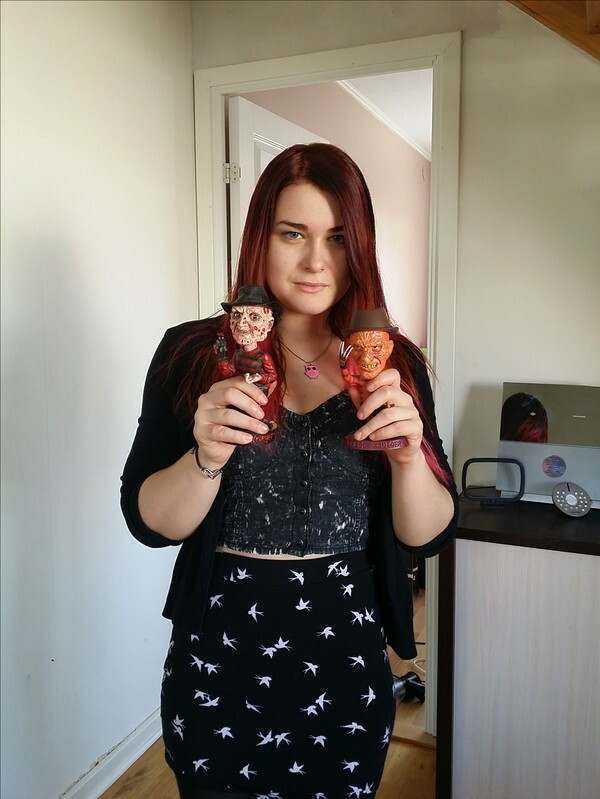 This was my second year attending this festival and I did not expect to have this much fun, I did not even know that it was possible to feel this good by just watching horrormovies among other horrorlovers. 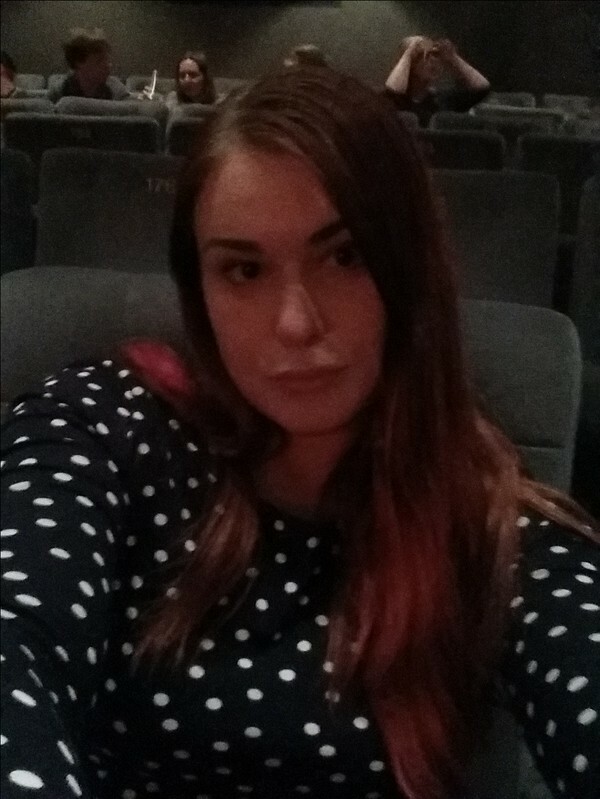 I knew that I wanted to watch as many movies as I could, so I had saved up some money for it and I ended up buying tickets for 14 films, I wanted to see more, but some movies were playing the same time, so I will have to see them some other time. The first film that opened the festival was Tusk by Kevin Smith. I took my mom and my friend David to see it and when we entered, we were given goodiebags by SubDvd which contained a movie, buttons, booklets and other cool stuff. I had my big bag of popcorn and was ready to begin this festival by watching Tusk. After Tusk we all went to a party for the festivalfolks and I bought some ciders to drink and later on there was a horrorquiz, in which me, David and my mom won second place. We were awarded with 4 actionfilms on bluray, so this evening was great and I felt that the people behind the festival did an amazing job by organising this the way it was supposed to be. The next few days were filled with really high quality movies, great friends, awesome buys for my collection and I met some new people that seem really nice and genuine, I really felt that this is my world and that I belong here. The best movies for me were, Tusk, Der Samurai, Miss Zombie, The Scribbler and What we do in the shadows. I highly recommend you to see them as soon as possible, because they all bring something different to the genre and puts their own spin on it. New horror can be really good and these films showed me why. I can not say that there where many bad films, because the picks for this year's festival was great, nearly every movie made me interested and entertained. Strange Colour of your body's tears was a bit too confusing for me and even though I love Giallo films, that one did not speak to me as it should have, but is was still beautiful for the eyes and ears. 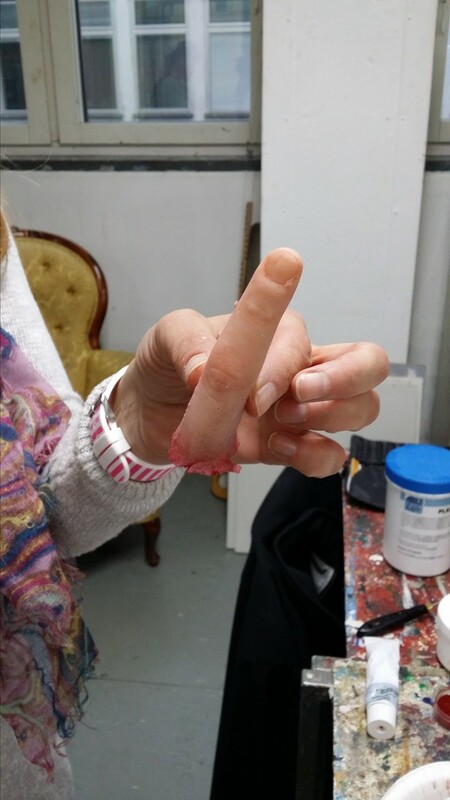 I attended a workshop which you could and I learned how to make bodyparts from silicone and how to properly make wounds and what materials are best, so me and my mom are going to make some awesome props for upcoming horrorprojects, because it was a lot of fun. The last film of the festival was What we do in the shadows and the festival provided beer and chips for us, so that was really nice. 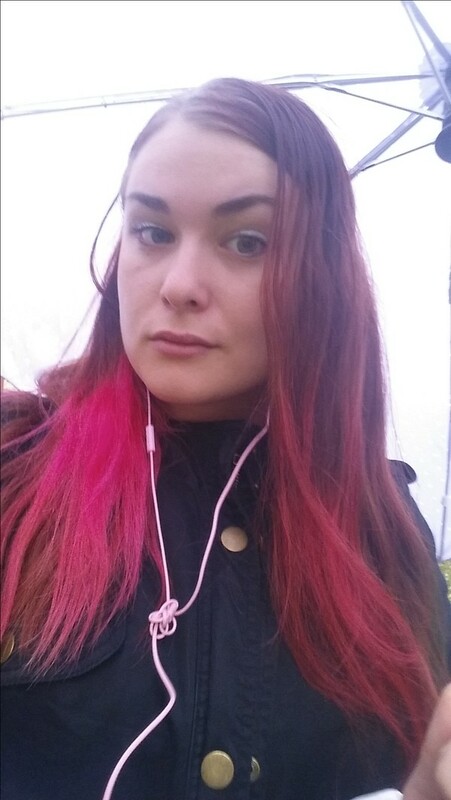 I could have gone to an afterparty, but I was really tired and just wanted to go home, relax, watch another movie on sfanytime and just think about what a success this festival was. 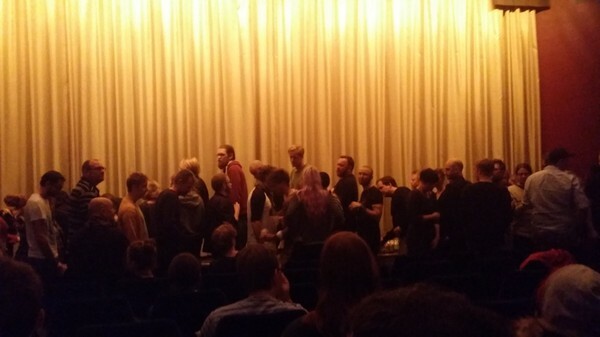 The theathers were packed with people and many movies were sold out, so there is a huge interest in Sweden about horrormovies and that gives me great hope for the future. I felt that this festival was arranged by people that love this genre and want us to be able to view the films that they love. I felt the warmth and love everyday of this festival. I started day 3 with a visit to SubDvd to buy some new movies. 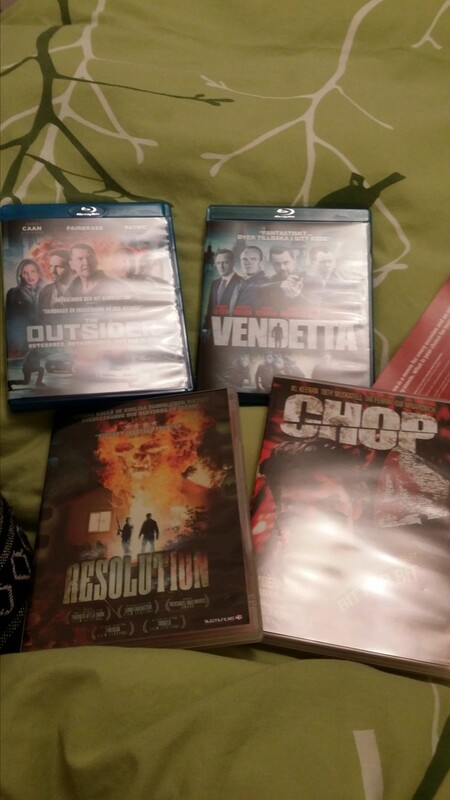 I bought 4 movies, Excision on bluray, Cold Fishh, Coffy and Hallucinations of a deranged mind on dvd. 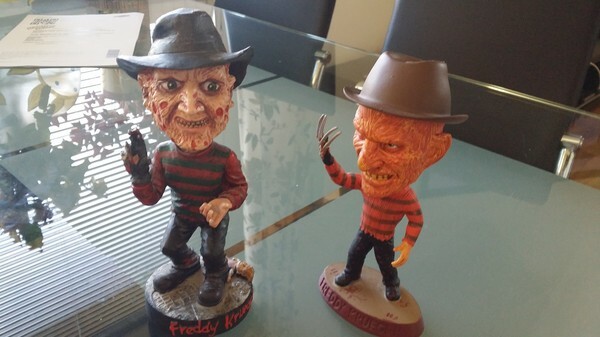 I also bought two Freddy Krueger dolls from the girl that worked there, she was so nice to sell them to me. I saw 5 movies at the cinema, Miss Zombie, Let us prey, Among the living, Starry Eyes and Strange colours of your body's tears. 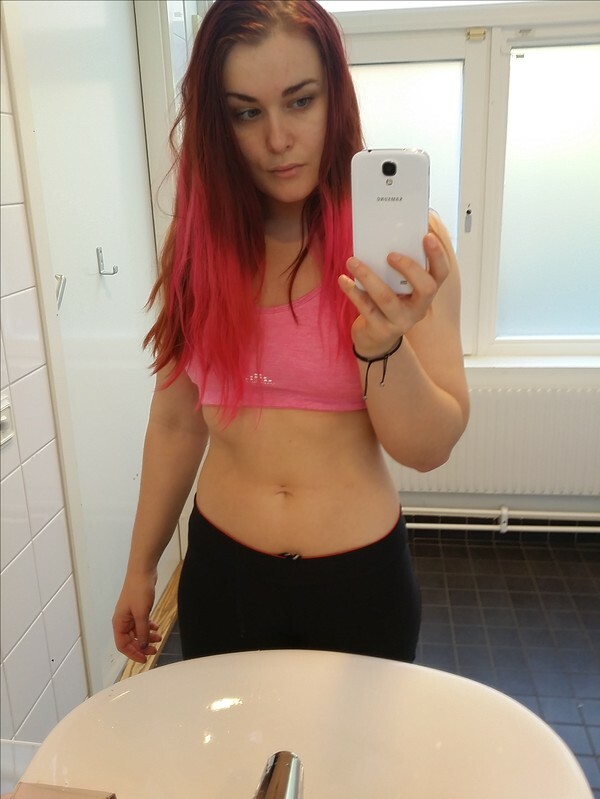 The day was great and today will be awesome aswell! Yesterday I saw 4 movies at the festival. It began with the Sci-fi film Debug. 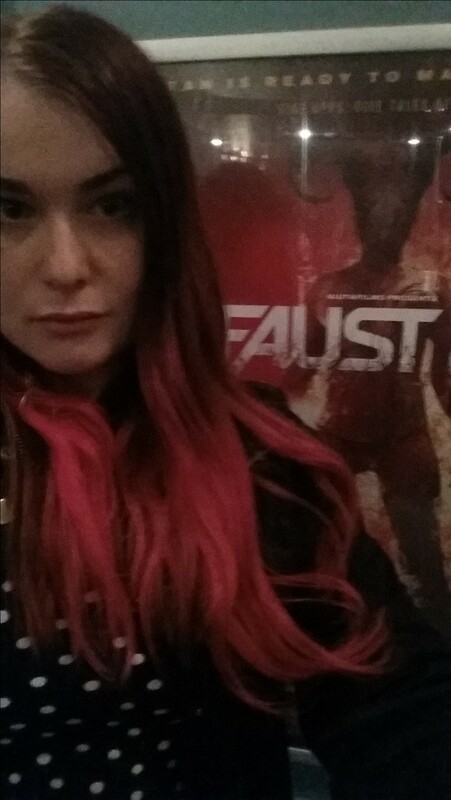 After that I saw Der Samurai and headed to Sture to watch the premiere of the Swedish horrormovie Faust 2.0. The last film was Open Windows. I got a goodiebag at Faust 2.0 with a new movie, score! The best movie of the day was Der Samurai, a German film that rakes unexpected turns and had a great story. 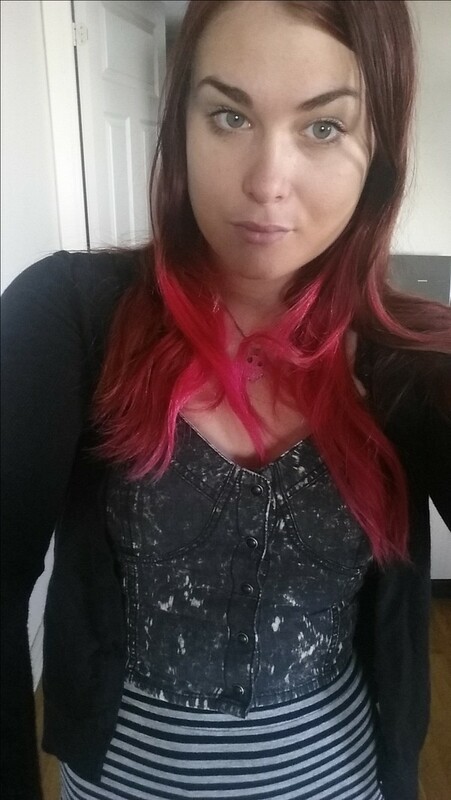 I am on my way to the second day at the festival! Today I am planning to see 4 films, Debug, Der Samurai, Faust 2.0 and Open Windows. I am looking forward to all of them. I will eat so much popcorn and candy that my stomach will probably explode, which will be appropriate for the festivale! Still can not stopp thinking about how awesome it was yesterday. 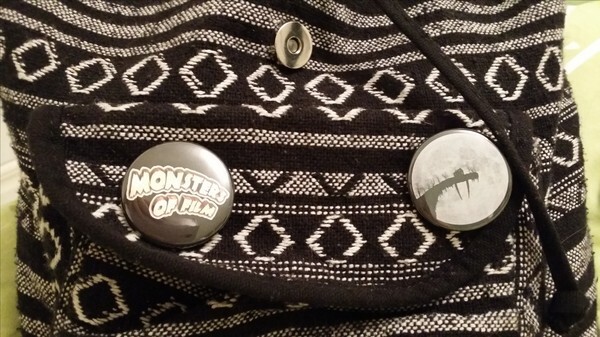 Just got home from the afterparty that Monsters of film festival had. 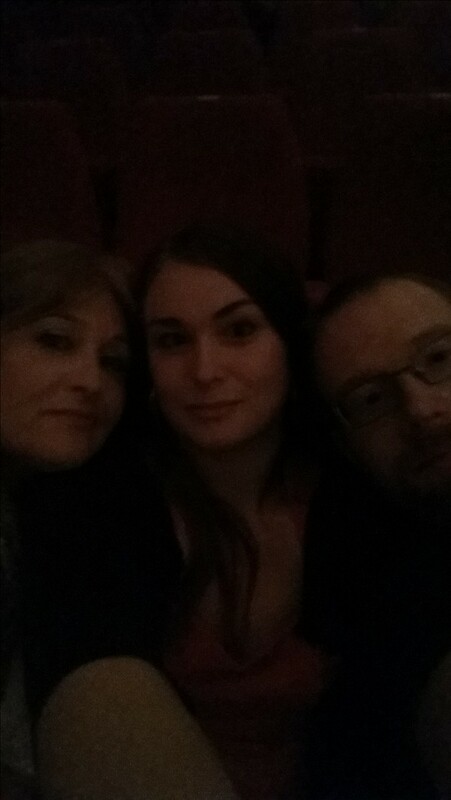 Me, my mom and David went to see the opening film, Tusk by Kevin Smith. I really liked it and was happy to finally watch it. When we arrived we got a goodiebag, with a movie, some booklets and other cool stuff. Me and my mom got two different movies, so that was cool to not get the same one. 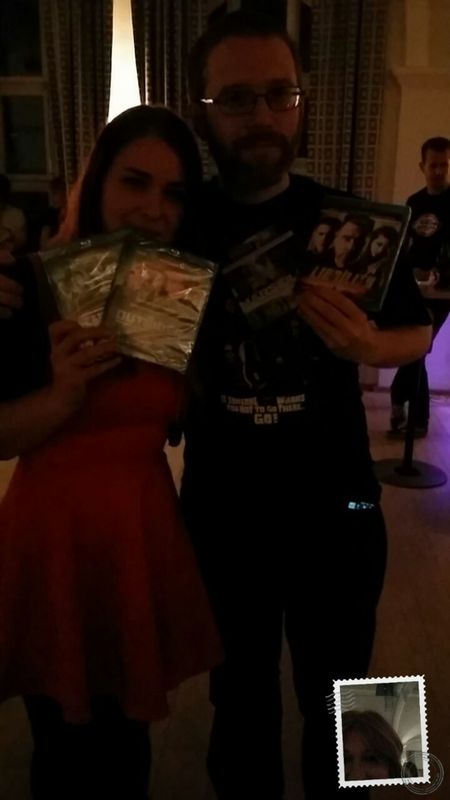 After the movie we went to the afterparty, where we had a few drinks and then it was time for a horrorquiz, me and David won two blurayfilms each and we were superhappy with our Team Polsky! 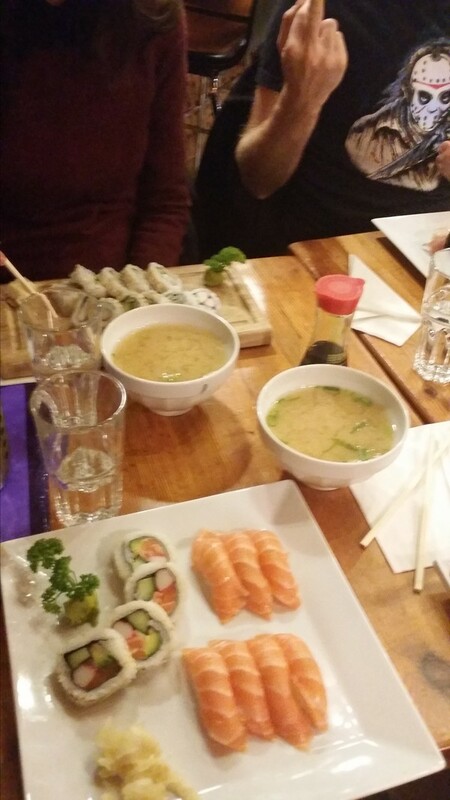 We talked with a friend of mine that we met at the party, which was fun and then we went home. 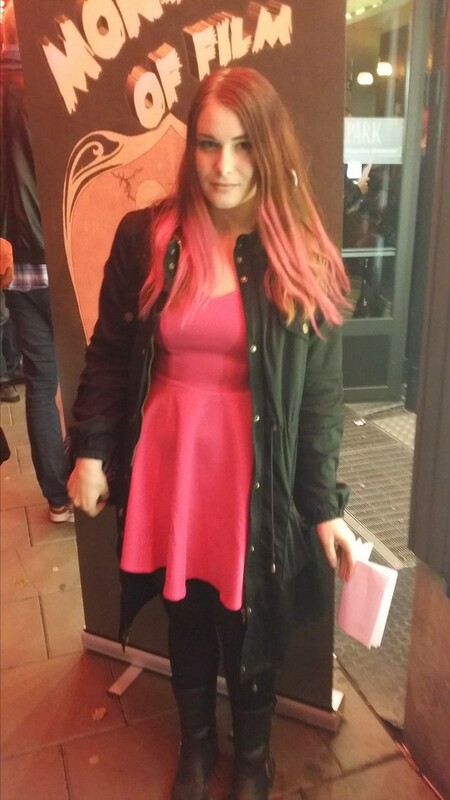 It was a really fun night and now I have 4 more days of horrorfilms to look forward to. 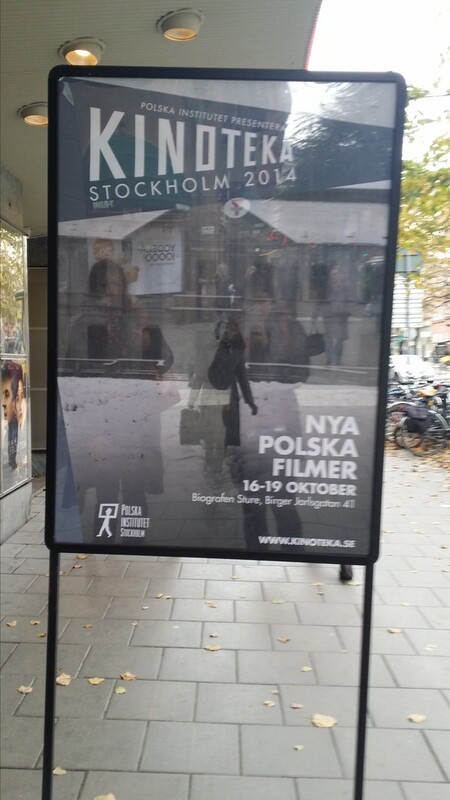 Today the Monsters of film festival begins in Stockholm and the first movie to be shown is Tusk. I am going to watch 14 movies and be part of a workshop, so I am really looking forward to it. Will you be there? 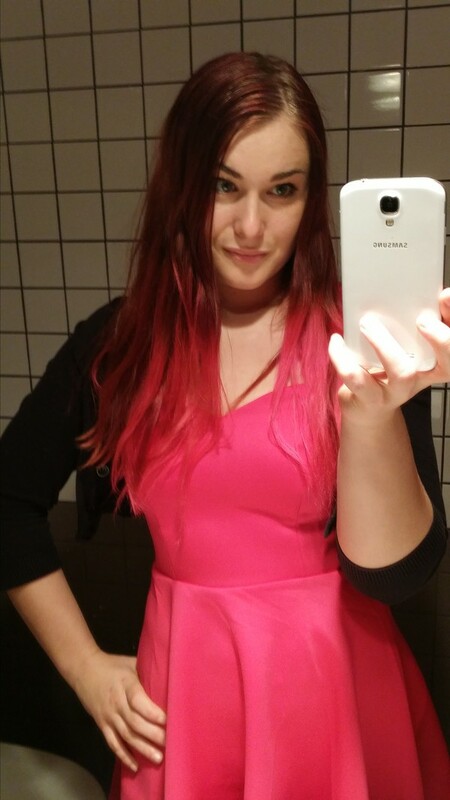 Yes I have pink in my hair right now and a new dress for Tusk and the party afterwards!